those tasks you’ve read – or been told – you’re supposed to do every day, every week, every month, every year, and so on. From housework to paperwork to plain old get-a-job work, they're the relentless chores and duties of everyday life. For some of you, these may be mildly annoying, but others of you in our far-from-perfect world may feel like these are all there is to life. I write in a light-hearted vein on this subject, but I'm aware that many readers may be deeply unhappy, even oppressed. The beginning pages of The Everies Book include a guide to using it even if you currently feel powerless. I want you to gain a little more control in your everyday life, so you can begin to have more choices and a happier life. For perhaps the first time, these Everies propose a systematic approach to apparent drudgery that not only makes tasks more manageable, but indeed central to attainment of your long-term plans. Uniquely, these Everies include goal-setting and goal-pursuing steps, both obviously -- in the form of regular paperwork actions, but also embedded in the way I've grouped together certain kinds of tasks. Together, these activities help other people in a two-way street proposition: your personal Everies take others into account as part of a shared journey. This removes guilt, encourages others' support, and inspires those others to achieve things for themselves while you help each other along the way! Let’s ponder a common alternative. Do you sometimes feel torn between everyday duties and ‘having a life’? That tired phrase, or ‘having it all’, now translates for many of us into, ‘being so exhausted by trying to do it all that I can’t enjoy what I already have’. The treadmill spins faster than ever before, with reckless swerves and halts that keep you clinging. There are fewer chances to step off, and sapped energy prevents us from using those breaks to appreciate life and go for what we want. I’m not necessarily talking about huge dreams here, although they could be. What you want doesn’t have to be extraordinary to remain out of reach. Your particular mill wheel might even tread too slowly. It could seem out of your control entirely – more like a windmill at the mercy of shifts in climate; or you could be working the wrong mill wheel altogether! Finding the wherewithal to savour this mix can be the very thing that prevents it happening, too! ‘Stuff’ plays a bigger part in consequences than we realise (before decluttering shines a light on things), but the management I refer to is not just about the stuff. The more you are able to direct your own activities, and the more you have arranged all factors to support you through the unexpected, the more enjoyable life’s longer haul will be. That’s why you need a system that can be used over and over to maintain order, enhance your current life, open the door to a better life, permit change, predict or minimise chaos, restore order, manage your new & improved life, and so on. It should be able to do that wherever your starting point is each time, and you should be able to use the system in harmony with other systems – politics, economics, faiths or social games – that may rule your world. The Everies Book provides that system. It’s suitable for men & women of all ages. You’ll experience the relief that decluttering brings. You will learn how to do what’s necessary, when necessary, leaving you free time to enjoy life and get on with your plans. You’ll no longer have to feel torn between getting organised and getting things done. Over the course of a year everything will get done! It additionally guides you through a year of action plans on your New Year’s Resolutions or other goals – this book can act as your personal coach! Decluttering and goals attainment complement each other very well. The clearer your space gets, the easier it is to take the next step on a long-term plan; and the more steps you take on such plans, the easier it is to assess the relative worth of elements in your surroundings. Even if you don’t have particular goals you want to achieve and are not too excited about the organising culture, please be aware that decluttering can have amazing effects in its own right. Clearing up the kitchen can lead you to healthier eating habits. Sorting out papers can help you see ways to reduce debt. Smoothing household traffic flows can unruffle feathers. There’s health, wealth & wisdom right there! 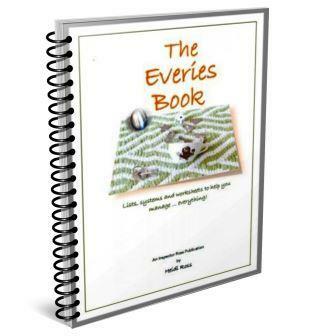 Buy a copy of The Everies Book directly from my Store . If you want a sneak peek, view the TOC (table of contents) -- or scroll to the bottom link if this one didn't work. This book is suitable for men & women of all ages. The idea is that you will learn how to attend to commitments piece-by-piece so you can regularly take your mind off the stuff and turn it to more interesting pursuits. But, yes, this book may have you doing even more housework and chores than you’ve been used to! They’ll be fast, though. The trick lies in stopping when the day’s assigned tasks are finished. Once you get used to leaving certain things undone, knowing you have done enough for one day, you’ll find it easier to maintain the momentum needed to continue organising different parts of your life all year long. The peace of mind you’ll get from this approach will be quite magic! The end result is, there’ll be ample time to ‘have a life’, as people say. The Everies Book enhances even this by additionally guiding you through a year of action plans on your New Year’s Resolutions or other goals. The One-Page Coach – this page alone is worth 4 times the price of the book. Useful glossary and thorough referencing. See? I wasn't kidding! This is a very, very useful 98-page e-book in PDF format. That's A4 (workbook-sized) pages -- it's big! I also have plans to publish it in a range of other e-formats as well as in print, so that anyone who has any freedom to act at all can easily access The Everies Book and use it to improve living conditions. It’s hard to imagine a lifestyle, no matter how dire or luxurious, that couldn’t benefit from isolating at least one of those Everies which have gone rogue, and bringing it back into line. If you seemingly have everything humming along, consider any overlooked areas that could undermine things and polish them up. If you are in poverty or under repression, find steps in here that will help you gain a footing in some small area. From there, gain more. Eventually you should feel the shackles loosening. If you have no freedom to act at all, yet have somehow found this page, I sincerely thank you for reading this far. If you can possibly get the book, I believe it will help you even before you can start putting it to real use. Begin by making plans. Consider in detail how you might apply one or two of the simpler Everies. At the first opportunity, do so. Then another, and another. Just keep planning and then using those opportunities that show up, to do more. Any gain is worthwhile. Keep going. For those who are rattling around between extremes, it will be easier to see how compartmenting the Everies will help you balance your time between needs, wants and long-term plans. The Everies Book will be your guide throughout a year of doing just that. This E-book is available now!